Don’t you just love it when you think you got a good deal? 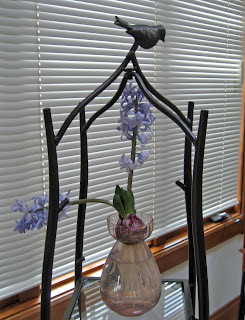 I thought it was a good deal to get two hyacinth blooms out of one bulb. In fact, several of my hyacinth bulbs had more than one bloom this year, the first year any have had multiple blooms, that I can remember. I also think I got a good deal when I bought my seed racks fifteen or so years ago for about $30 each. 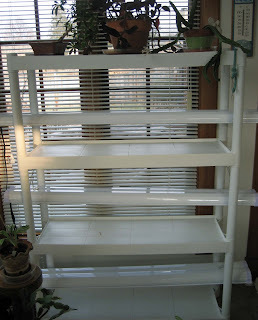 These seed racks are basic plastic shelves, with each shelf holding one and a half flats. I hung the light fixtures with some shower curtain hooks and a short piece of chain, so I can raise and lower them to accommodate flats of seedlings or small plants. These are just standard shop light fixtures sold at most hardware stores. I replaced the light fixtures last year because those ballasts don’t last forever and bought new light bulbs at the same time. The bulbs are just standard fluorescent lights. I decided to go with those because they were cheaper and the plants will get some natural “full-spectrum” light from the nearby windows. I use light timers to turn the lights on early in the morning and off late at night so that the seedlings get 18 hours or more of light every day. As I recall, the timers were sold around the holidays for Christmas lights, and I bought them for half price after the holidays were over. Yes, for someone who looks like she spends with abandon for hoes and seeds and other necessities of gardening, like the new plant stand the hyacinth is on, I can be quite cost-conscious. We’ve all got to be that way these days. If you would like to know more about my seed racks, check out this latest video from May Dreams Gardens. It’s a “talkie”! I thoroughly enjoyed visiting your sunroom and seeing your plants and seed starting equipment. Awesome post! Thanks for the tour! I'd love to have a room like that on our house. It looks like a easy to put together system, effective too. I can't wait to hear and see your seeds filling the shelves. Tell us what kind of seed mix you will use. I have used all manner of mixes and jiffy7s in the past. this year I bought some special mix from a local nursery which was an absolute disaster. It was supposed to be worm casting and vermiculite and sand. I had to rescue some of the seeds as they sprouted. many died and some just never germinated. The mix held too much water and damp off was a problem. I tool the 1/2 bag back. I'm going back to Sunshine mix or mixing my own. I'd love to know what you use. I used to have an old door which I positioned in the kitchen window. It worked really well-then I got a greenhouse and love it. Thanks for the comment on the lights. I wasn't sure if you needed any special bulbs. Very handy setup. Sounds like you can get quite the production going. Thanks for sharing. That is great info! Now I know exactly what to do. Thanks so much!I'm always confused between warming pads and lights. And I hate the trays spread all over the house! Carol, thanks for the tour of your sunroom and the seed shelves. Handy set up. I marvel at the number of plants you will be able to begin. Mostly veggies? Mostly flowers? 450 is amazing. I have a night blooming cereus too. Mine is in the garage in the winter to 'rest' and then on the deck in the summer. The blooms are truly incredible. That was really a great idea to YouTube your sunroom and seed racks. Even though I don't need to start seeds indoors I can appreciate any instructions someone is willing to "show" me. Always helpful to actually see what you are writing about... for me anyway. Keep the instructions coming... you are a wealth of much appreciated knowledge. Thanks. I used to have the fluorescent light system too. I'm experimenting with LEDs this year to see if they work as well. They cost a lot at the start, but last for 50 years and with the energy savings will pay themselves back in a few years. racks for hanging the lights between the shelves and works great! I really enjoy reading your posts! Hi Carol, it is good to know you are not a spendthrift when it comes to things other than hoes. :-) Your lighting system is great. I am wondering how long to expect the light fixtures to last, having read the bulbs themselves should be replaced each year. Also those timers. Mine will only go on at dusk and off at dawn with a max setting of 8 hours manually, not enough hours. I thought the daylight plus the night light would not be good for the babies so didn't use them and have to remember to turn them off and on. What is your experience with this? I have one timer that can be set for any time off and on, so the other set up has to be turned on and off by me. great setup, I like the shower curtain hook and chain idea. Looks very professional. What a cute video Carol. It was fun seeing your sun room. Your seed-starting shelving setup should inspire anyone wanting to do such a thing. 450Plants!!! Wow is all I can say to that. I hope to see updates about your seedings when they get started. That's a great set-up...we have a shelving unit that will serve a similar purpose this year. I like that the florescent lights with sun exposure are enough to keep the seedlings happy. In the past we have had one shop light propped up on the laundry counter. I've used a similar setup for the last few years. When are you planning to start your seeds? I usually get antsy and start too early. I was just looking at my seeds tonight and wondering if it is still too early. I'm ready! Carol I love your seed rack. We used to have one, but living in a warm climate as we do, it's easier for me just to start the seeds outside in April. I think I'm one of the few hard-core gardeners in my area who doesn't do proper winter-sowing. It's no surprise to see that you've come up with such a attractive, thrifty way to grow a lot of plants from seed. Philo watched the video, too and was impressed with your compact design. It was very cool to see the whole sunroom, with the plants tucked everywhere, even on top of the plant rack, and the enormous Queen of the Night. But that's not why I watched the video twice...the best part was hearing your voice again, Carol! It was like being in the room with you. Well, you might not have heard of punnets, but I've never seen a seed rack before! Amazing all the trouble you cold-climate people have to go to.